Here are some new ways to enjoy apples beyond eating them or using them in salads or baked in a pie. The apples in the recipes below are commonly available in the autumn and winter in most markets. Apples that hold their shape when cooked: Fuji add an intriguing zing to quiche…Granny Smith are very tart with a high acid content that makes them good for baking. 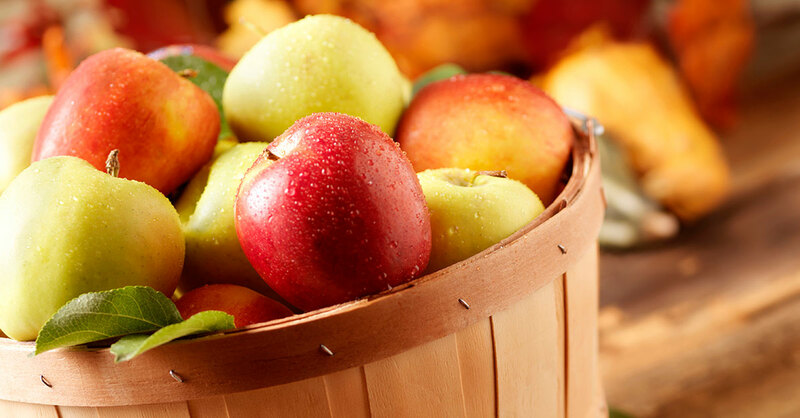 Apples for snacking and salads: Cortland is good for salads or instead of crackers with dips…Gala can be used in salads, fruit salsas, relishes and chutneys…McIntosh’s tender white flesh cooks down quickly. Apples for snacking but not for salads: Red Delicious are best eaten fresh—they don’t hold their shape when cooked, and the flesh turns brown quickly. Curry powder, ginger and coconut milk flavor this warm and inviting soup. The Cortland apples used are crisp, blending with sautéed onion, lentils, almonds and cilantro and adding a pleasant contrast in texture and flavor. Heat the canola oil in a large saucepan over medium-high heat. Add the onion, carrot and celery. Sauté for five minutes, stirring occasionally. Add the curry powder, flour and ginger, and sauté for about 30 seconds. Stir in the chicken broth and coconut milk. Bring to a boil, and add the lentils. Reduce the heat to a simmer and cover. Cook for 20 minutes. Add salt and pepper to taste. 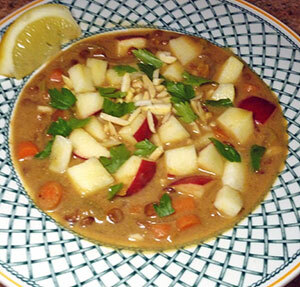 To serve, divide the apple cubes and almonds between two bowls, and ladle the soup over them. Sprinkle with cilantro, and place lemon wedges on the side. Fall harvest sweet potatoes, tomatoes and apples are combined with turkey sausage to make this a tasty ­autumn stew that also works well any time of the year. Cooking the ingredients in beer adds an intriguing depth of flavor. There are several types of turkey sausage available at most supermarkets. I prefer the mild ones for this dinner, but if you like your stews with a kick, buy the ones marked hot. Heat the canola oil in a large saucepan over medium-high heat. Add the sausages, sweet potato, onion and green pepper, and sauté for five minutes, ­stirring occasionally. Add the apple, tomatoes, beer and fennel seeds. Bring to a simmer, lower the heat, cover with a lid, and simmer gently for 15 minutes. Add salt and pepper to taste. 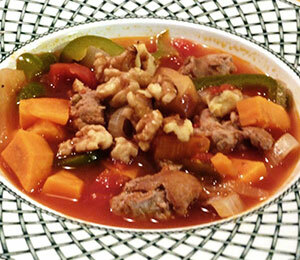 Divide the stew between two large soup bowls, and sprinkle with walnuts. Fuji or Golden Delicious apples work well for this dish. 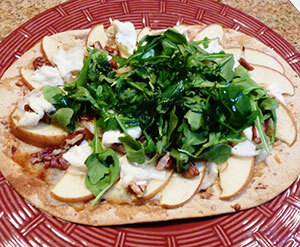 The sweet flavor mixed with ­onion, cheese and arugula creates a sweet, tangy flatbread. Look for ready-made flatbread in the supermarket. This recipe uses flatbread that measures seven x 10 inches—a very thin pizza crust also works. Preheat the oven to 400°F. Line a baking tray with foil. Place the flatbreads on the foil. Spread one-half tablespoon of the olive oil over each flatbread. Evenly spread one-half cup mozzarella cheese over the olive oil. Arrange the apple slices overlapping in a spiral over the cheese. Place the onion slices over the apples. Sprinkle the pecans on top. Cut the goat cheese into small pieces (about one inch each), and evenly place them on top of the flatbreads. Bake in the preheated oven for 15 minutes. The apples will be soft but will hold their shape. Top each flatbread with one cup of the arugula, and drizzle the remaining olive oil over the arugula. 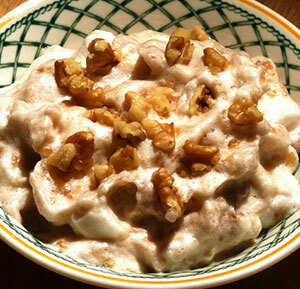 This light, fresh dessert is like biting into an apple-­cinnamon cloud. It calls for McIntosh apples, which are sweet and tangy with tender white flesh and cook down easily to make a purée. Add the apple pieces to a saucepan with the water, honey and sugar. Stir to combine ingredients. Place over ­medium heat, bring to a simmer, lower the heat and cover. The apples should be soft after about five minutes. Simmer for one or two minutes longer if needed. Strain and purée the apples in a food processor or sieve. Mix in the vanilla extract and cinnamon, and set aside to cool. Beat the egg whites to stiff peaks, and gently fold in the apple purée. Spoon into two small bowls. Sprinkle walnuts on top. Serve ­immediately.